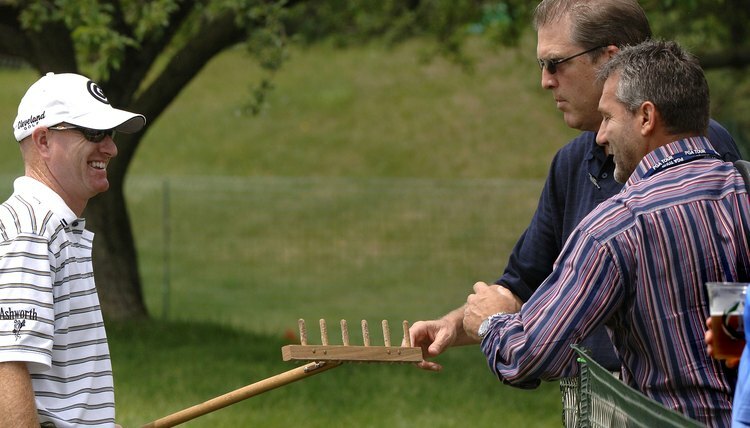 The Golf Channel's Frank Nobilo, right, examines an unusual rake used to prepare the sand traps at the 2006 Memorial tournament. Sand traps can be nightmares for casual or less-skilled golfers. If you don’t swing hard enough the ball may not leave the trap. If you swing too hard in a greenside bunker the ball may strike the green and roll into the rough, or it may fly over the green, perhaps even landing in another trap. Experiments regarding different ways to maintain sand traps are often aimed at making courses more difficult for professional players who may find a smooth, well-maintained trap too easy. Bunkers are typically raked smooth, but some courses have experimented with furrowed bunkers. When a ball lands within a furrow, the golfer must contend with more sand, making it more difficult to control and spin the shot. The Oakmont Golf Club in California, scene of numerous major tournaments, featured furrowed bunkers for many years before the course’s bunker sand was replaced by a lighter variety that was more difficult to furrow. A number of PGA Tour courses tried furrowed sand traps during the 1970s. In 2006, Jack Nicklaus asked the PGA Tour if for the Memorial tournament -- held that year at his Muirfield Village course in Dublin, Ohio -- he could add furrows to the bunkers. After tour officials agreed to the experiment, Muirfield’s groundskeepers used wooden leaf rakes in which every other tine was removed to rake the traps. To make the bunkers even more challenging, the traps were raked at right angles to the usual target line. The Memorial experiment lasted for three years. Indications were that the furrows made play from fairway bunkers much more difficult, while play from greenside bunkers was only slightly more challenging. In 2005, for example, 44.9 percent of players who landed in fairway bunkers reached the green in regulation, but the following year -- when furrows were introduced -- only 25 percent of golfers reached the green in regulation after playing from a fairway bunker. Meanwhile, 41.6 percent of players executed sand saves (holing out in two after landing in a greenside bunker) in 2006, down slightly from the 47.1 percent success rate posted in 2005. Some courses build large grass hollows as alternatives to sand traps. These “grass bunkers” require less maintenance than sand traps, particularly in areas of the course where water is likely to collect in a standard sand bunker. One disadvantage to grass bunkers is their lack of visual contrast from a distance, so players who are unfamiliar with the course may not recognize the potential danger until they hit into one of the grass bunkers.